Ryan, Sarah and Posy Cook all voted at Mason's City Hall. The kids poll station mimics the stations where their parents vote. Instead of voting on officials to elect into office, the children vote on four categories: favorite movie, favorite sport, favorite vacation spot and mythical creature. Creatures included a unicorn, a dragon and a mermaid. Children are rewarded for voting with plush toys, an “I voted” sticker and a candy of their choice. Children who voted took colorful stickers. 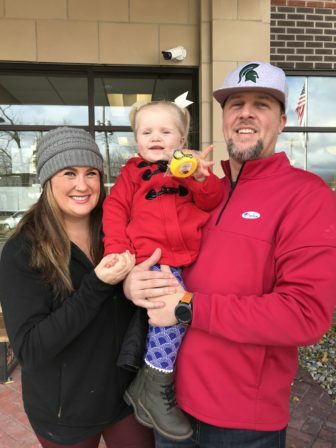 Mason parents Ryan and Sarah Cook took their almost 2-year-old daughter to the polls with them. Sierra is a junior in the journalism program at Michigan State University, with a focus on editorial and photography. She has been involved in several publications on campus, including The Tab MSU and the Red Cedar Log. Sierra is an avid reader and news junkie, but favors writing feature and investigative stories. At 10 a.m, the lines to vote at Brody Hall were filled with first-time voters looking to make their voices heard. Muskegon native Nicole Bernard said she was excited to be able to vote for the first time. Election 2018 coverage from the students of the Michigan State University School of Journalism.